Experts have been awarded funding to unlock the secret past of Bennachie. Archaeologists are hoping to shed new light on the history of one of the most famous landmarks in the north-east. Experts from the University of Aberdeen have received new funding to create a heritage project for Bennachie and the surrounding landscape. They are now calling on the local community to get involved in the research which should unlock the secret past of the popular walking destination. The initial aim for archaeologists will be to gain new insights into a 19th century settlement of farming families, known as 'the colony' which lived on Bennachie from the 1830s. 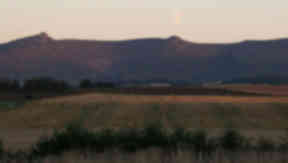 Dr Gordon Noble, archaeology lecturer at the university, said: "Whilst Bennachie is widely acknowledged as a historically and archaeologically significant location, very little work has been done in terms of detailed survey and excavation to build a picture of the archaeology that is actually present on the hill. "The intent of this project is to get the community involved in our research into Bennachie, offering locals the chance to take part in a variety of events on the hill, including archaeological digs. "The long-term aim is to equip community members with the knowledge and skills they require to do their own work into the history and heritage of their local area." To get involved, contact Colin Shepherd at colin@scottish-heritage.org.uk.